This entry was posted in "Four legs good", Favorite Perfumes, Single Note Exploration, Tea Party and tagged Aqua Allegoria Pamplelune, Assam & Grapefruit, Eau de Pamplemousse Rose, grapefruit perfume, Guerlain, Hermès, Jo Loves, Jo Malone, Lupicia, Pomelo. Bookmark the permalink. Mum and Dad would share a grapefruit for breakfast at least once a week in summer. They were cheap and yummy and we kids would have other fruits in a fruit salad with maybe one segment swapped with M & D for a strawberry or banana piece. Since then I don’t think I’ve eaten grapefruit but I love the juice. I own none of your grapefruit fragrances mentioned, you have given me a mission Undina, thank you. Please try Guerlain’s one – I’m sure you’ll love it (unless it goes bad on your skin but I hope it won’t). Pamplune, the Aqua Allegoria. you’re right. I have an unopened bottle of it somewhere here Undina. I will ferret it out and spray. Thanks for the reminder. I will be back with word on the outcome. I adore grapefruits sliced, grilled, juiced, tinned, in salads and with fish. They were a treat as a child and a staple now as the years spin buy and I would not be without out them. Pamplelune is probably my favourite of those perfumes you list (and I’ve never got anything of that feline note others talk so incessantly about). I would also put a word in for Floris’ Pink Grapefruit (now, I think, gone). One thing British perfumery excels in apart from lavender and bouquets is the citrus and this should stand among the ranks of all those exalted limes. I don’t think I’ve ever tried grilled grapefruit, so thank you forthe idea, I’ll investigate it. Floris isn’t represented well here so in combination with the scent being discontinued I don’t think I have any chance getting a sniff of that one but I’ll take your word for it. Thank you for this post, Undina! I read somewhere that smelling grapefruit can help people lose weight. It is supposed to energizes us or curb our appetites or something. There are also all kinds of diets using grapefruit for breakfast. Grapefruit never worked for me that way. I just love eating it so much that all I manage to do is put on extra pounds. Grapefruit perfumes? I enjoy DSH Pamplemousse en Plus (I think that one is discontinued). DSH does another grapefruit but unfortunately it lasts only a moment on my skin. I know what you mean about diets: all those recommendations are good for people who do not love and normally do not eat fruits. If I hadn’t tried to watch how much I eat I would have eaten at least twice as many fruits. I tried DHS’s Pamplemousse (don’t remember “en Plus” part in the name) but it wasn’t one of my favorites, I couldn’t smell too much of a grapefruit there. I LOVE grapefruit. Nothing else like it. And reading this is making me really crave one. I love grapefruits! Haven’t found one I love in a perfume, although I think that Imaginary Authors scent is pretty cool. Falling Into the Sea, I believe. Thank you for the recommendation, I’ll try to test this one when I get a chance. I should try preparing it this way! Not that it’s not sweet enough for me without an extra sugar but your description of that sugar crust make it so appealing. I’m with you in terms of loving grapefruits. I especially like the pink ones. Have you tried eating a grapefruit with kiwi? They make quite a nice pairing of flavors. Pamplelune is one of my favorite grapefruits, so is 1725 Casanova by Histoires de Parfums. We have one Aqua Allegoria at home, it’s my mums Mandarine Basilic, she likes it more than Pamplelune. And thank you for mentioning my Pomelo post. I haven’t tried 1725 yet but will remember to do that the next time I’m in the store that carries the line. And I should try grapefruit with kiwi: I’ve never even thought about that combination (though I often used kiwi in fruit salads with orange, apple and banana). Before my stomach turned on me, I used to eat grapefruit regularly–my grandparents had a tree. Pomelos are even better, though. I have an old bottle of M. Micallef Pomelos, and although the top notes have turned, after about fifteen minutes it’s delightful. I tried pomelos several times but they were too sweet to my liking, I prefer grapefruits. Hello Undina, I also love grapefruit…the pink ones, just like twin Lucas. I don’t eat it as a whole fruit often because 1) it is quite messy as I have to peel off the bitter outer covering of each segment; 2) I often get the juice in my eyes; and 3) (and this will sound like I’m high maintenance food-wise between this and my other food quirks / sensitivities / preferences) it is too acidic for me even if it sweet — not to horrify anyone but I can feel it “burning all the way down to my stomach” very much like what happens when I drink alcohol but that has never stopped me from enjoying an occasional drink. That said, I have had the jarred grapefruit segments and those are quite good and satisfies my grapefruit cravings. As to perfumes with grapefruit, I like Hermes Un Jardin Sur le Nil. P.S. 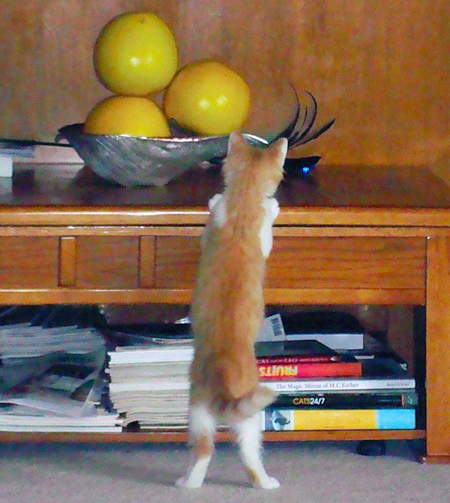 That first picture of Rusty…was that taken when he was a kitten? He looks a lot slimmer but it could be that he’s more elongated trying to get to momma’s grapefruits. He is such a cutie! I like Un Jardin Sur le Nil and gone almost through the whole bottle of it but grapefruit isn’t dominant in it for my nose. I have to buy a special spoon and try! Undina you have the grapefruit covered from all angles. Loved reading about your introduction to the bitter sweet joy of the fruit. My favorite perfume in the grapefruit/pomelo category is Ormonde Jaynes Osmanthus, especially the start has some very authentic pomelo in it! OJ Osmanthus is a perfume in the line that gets less attention from perfumistas. I have a sample of it so I’ll retest it. I love grapefruit in ALL forms, including the juice I drink almost every morning. We are lucky in Texas we get grapefruit very fresh here because they grow a particular kind of very red grapefruit down in the Rio Grande valley. I keep meaning to pick up a bottle of Pamplelune. I am pretty sure you can find that one at the discount sites. It’s so good! I like grapefruits from Texas though I’m sure locally they are even better. Oh, I had another idea about grapefruit scents! I think the Bath and Body Works Pink Grapefruit scent is really not half bad for what it is. I have a few of the lotions and enjoy them. They no longer carry it in stores, but I thought they were still carrying it online… but I went and looked just now and it seems they’re out of stock. So maybe it’s totally gone. But it was one of their better scents. I love grapefruit, but rarely find a grapefruit perfume that smells convincing on my skin. The most photorealistic grapefruit for me comes from Thymes Agave Nectar Body Lotion. Not the perfume, not the hand lotion, but the body lotion. I can’t tell you why, but there it is. I adore grapefruit (and Pamplelune is one of summer favorites for me). That said, I grew up loving it as my grandmother often peeled some for my sister and I and we both loved eating them. She still talks about how once the three of us ate 5 of them in one sitting. Today I am incredibly grateful to my grandmother for teaching me to love all the good food – fruit and vegetables and a healthy diet. I got a thing or two from my grandmother as well (food-related, I mean, otherwise I got a lot – my love to perfumes for one). I can easily eat two good grapefruits in one sitting though I’m trying not to overdo that. Wow, it’s quite to insight to learn that you only knew of oranges and lemons in your country of origin until grapefruits showed up at age 10. I remember eating grapefruit very often as a child. And I tossed it heavily with sugar. 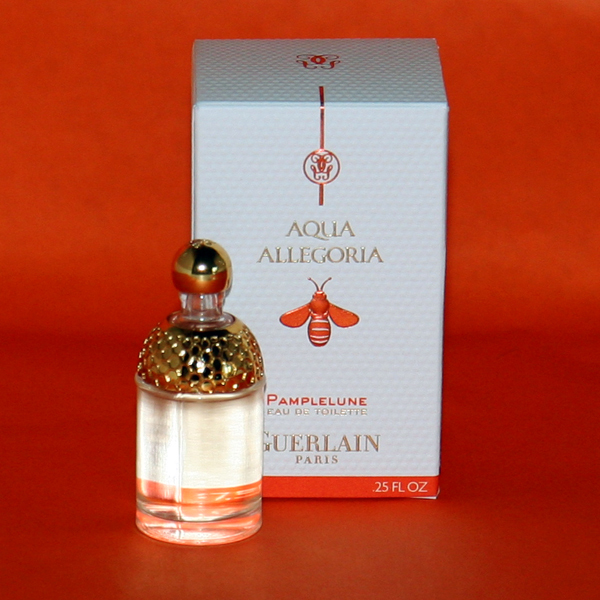 As it comes to Pamplelune from Guerlain I’m one of the “lucky” ones to get a cat pee from it ;-). I love it when it is sprayed on a paper or just the opening on the skin, then it just goes towards cat pee. In childhood everything tasted better with a lot of sugar… Well, almost everything (I do not recommend repeating my experiment with a vegetable soup ;) ). I’m sorry about the cat pee part since it’s such a cheerful and beautiful summer perfume. But you have to follow your skin chemistry and I’m sure that at some point there will be a citrus (not necessarily grapefruit) perfume that works just right for you. I have historically been a bit of a grapefruit refusenik, in life as in perfume, and still don’t care for the juice, unless it is very pink with loads of sugar piled on. My friend Gillie toasts sugar-laden grapefruit, brulee-style, and that takes the acerbic edge off quite well. As with civet and other note no-no’s, I am gradually coming round to a grapefuit note in perfume, and found Pamplelune perfectly pleasant on my brother and my own skin! (Thanks for the link, btw.) I also quite enjoyed the recent Miller Harris release Pamplemousse, and my grapefruit tolerance may be an ongoing work-in-progress. After all, when sudden onset perfume mania struck me, the only bottle of scent I owned at the time was EL Intuition, which is like Stella with added grapefruit! And the note didn’t bother me there….Perhaps it was an omen. It’s an interesting idea – toasting a grapefruit. I keep learning new things about my favorite fruit. Thank you. I like DSH’s Pamplemousse, one of her best, I think, but can’t do many grapefruit scents – too much cat pee in them for me, I think. It’s amazing how much subtlety I now perceive in the different citrus fruits because of how I perceive them in perfume. I certainly never thought that much about them before as much as I do now. 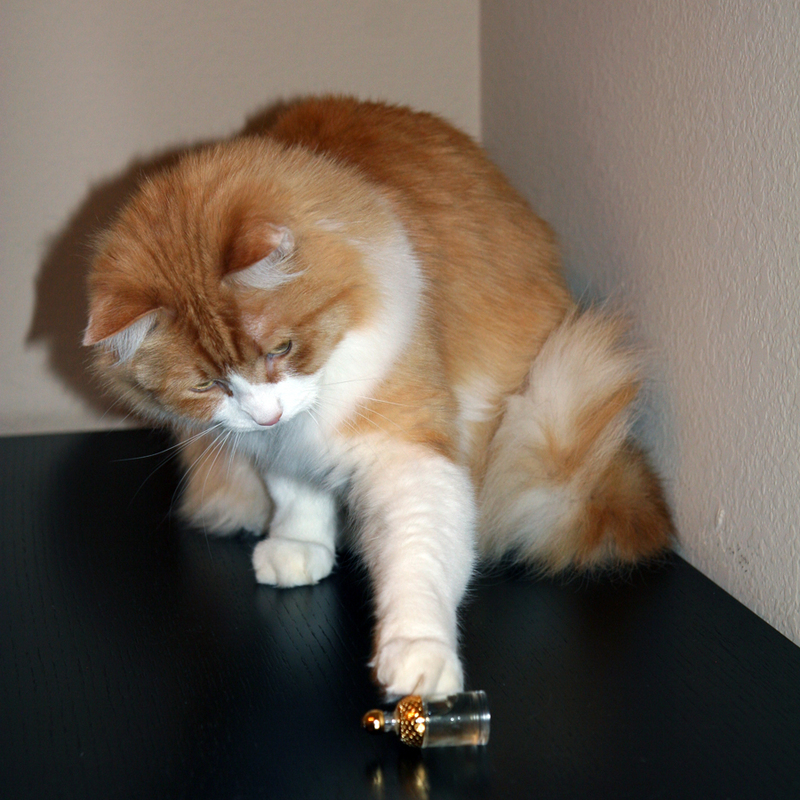 I like grapefruit … but usually not in perfume! I think I will have to try the recipe you linked however. That sounds yummy. Not even in summer? What do you wear when it’s hot? I can’t say I’m a fan of eating grapefruit – just the thought of it makes the enamel of my teeth flinch in anticipation of serious acidity! I haven’t even heard of this brand! From what I see in the search, it’s your equivalent of our Body Shop/Works. Can you eat other citruses? I don’t think of grapefruit as of an especially acidic fruit – so I wonder if we’re eating the same varieties. I suspect that Arran Aromatics is more localised than Body Shop or BBWorks but it might have some presence Over There. I do eat citrus fruits, honestly, but grapefruit also calls to mind Mother on a Diet times from childhood;-) Maybe the grapefruit varieties available now have more than just sharpness and deprivation to offer? Love grapefruit…for both eating and wearing :) and Jo Malone is probably my favorite….. I haven’t had good grapefruit in a while… I need to rectify it. And once it gets warmer, I’ll wear one of my grapefruit perfumes.